The phenomenon of Avatar returns again to DVD in Book 1: Water, Volume 4 that follows Aang who was once trapped in an iceberg with the fate of the world just out of his finger tips. Fortunately for Aang, he was freed by Katara and Sokka who now accompany our hero in order to protect the world from the dreaded Fire Nation as they war with the water tribes. 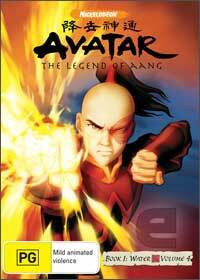 Just over 95 minutes, this complete movie once again joins Aang, Katara and Sokka as they brave the harsh climates as they battle their way to the Northern Water Tribe, however their mission is impaired by the Fire Nation who almost at every turn thwarts their mission. Featuring a healthy dose of action, more specially martial arts, it's easy to see how Avatar - The Legend of Aang has become a worldwide hits with both children and adults alike as it contains a healthy dose of drama, romance and good old fashioned action with first class animation.